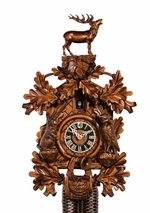 This cuckoo clock is by Rombach und Haas and is exclusive. The Bahnhausle design is very popular in cuckoo clocks. Click here for more pictures: 1 2 3 4 5 6 7 8.